Samsung's new flagships, the Galaxy S9 and S9+ have just made their debut in the United States, and customers can get either of them for special prices. The South Korean company has teamed up with US carriers to provide fans with various offers. While you can get the cheapest Galaxy S9 (T-Mobile) at Costco, Verizon is running a BOGO deal on Samsung's flagships, so you can get two at the price of one. However, if you don't need two Samsung top-tier phones, you might want to take into consideration another promotional offer coming from the South Korean giant. Besides the trade-in program where customers can exchange their older phones for up to $300 when they buy the Galaxy S9/S9+, Samsung offers two discounted bundles for each purchase. 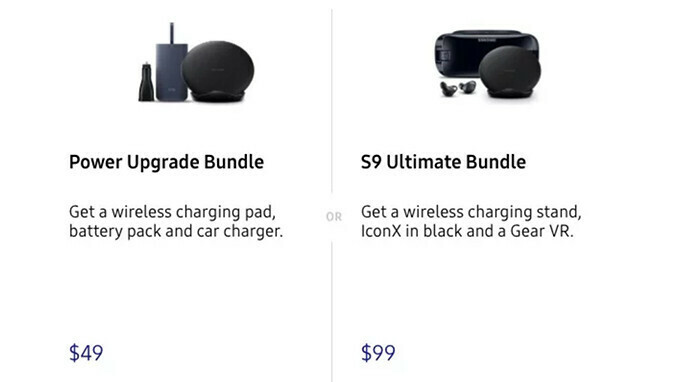 It's worth mentioning that you must choose one of the two bundles after you buy the Galaxy S9/9+, as Samsung won't allow you to buy both. Also, the bundles will only be discounted until April 6. So Samsung is rolling out Oreo and the new 9.0 launcher on Sprint right now :) Verizon too I hear. Hit your update buttons!! Samsung is in deep S*IT right now. Unless they move their brand new product fast within the first month, those will rot in shelves for ever. No one will buy the S9/S9+ because they are not a good enough upgrade. There are lots of choices in the Android world unlike in the iOS world. I'm so sad to say this but this is the truth!! It's an opinion not a truth. Please, do not get these confused. Piyath the Samsung hater strikes again. You have literally done this for months on end now. Stop spending your life on hating on a company that has done nothing to you, other than being the opposition to the brand your overly loyal to. It's just sad to watch. This days not only Samsung reduces the price and giving offers with there phones all Android OEM’s doing the same including Apple with iPhone X by the way they reduce the price now the 256GB cost 1000$ and 64GB cost 850$ people doesn’t want to spend money in phones anymore like before. No DeX bundle is surprising. Wish they would have offered this when I pre-ordered! Now I can't purchase unless I get another phone? !